For 89-year-old Arthur Evans, a former sergeant of the Royal Air Force (RAF), visiting the Jawatte War cemetery in Colombo brought back poignant memories of fallen comrades. Thirteen men from the 160 Squadron to which Mr. Evans was attached were killed in a plane crash at Sigiriya in the early 1940s. Their remains were buried at Jawatte, thousands of miles from their homes in the United Kingdom. Mr. Evans served in Sri Lanka (Ceylon) between 1941 and 1945 as an engineer with the RAF. He and eight other RAF veterans, accompanied by family members and care-givers, were in Sri Lanka recently on a two-week visit. They visited air bases in China Bay, Sigiriya and Minneriya – places where they had served more than 60 years ago, during the Second World War. “When we first arrived in Ceylon, it took us a little time to get used to the creepy-crawlies, the snakes, and the sight of elephants,” Mr. Evans told the Sunday Times. The bases the airmen served in were in the middle of thick jungle. One of their favourite pastimes was climbing Sigiriya Rock. When they had longer holidays, they would travel to Kandy in the back of an RAF lorry, while the journey from the Ratmalana airport to Colombo was done in a rickshaw. “One thing I remember well is the friendly and hospitable nature of the people, and that has remained unchanged between then and now,” he said. Group Captain Gary Bunkell, whose father Bill served in Ceylon from 1944 to ’45, decided to organise a visit to Sri Lanka after his father’s demise. 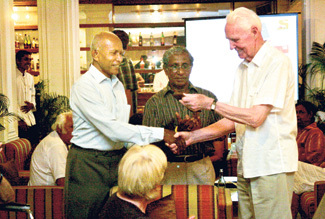 “It was an emotional experience for the war veterans – visiting the cemeteries in Kandy, Trincomalee and Colombo, but they were happy to see how well the graves are being maintained,” he said. The war veterans meet once a year in Stratford-upon-Avon, the famous town associated with William Shakespeare. They chose Stratford because of its central location in the UK. Before their departure for the UK, the RAF war veterans were presented with a plaque by S. S. Gunawardena, president of the Sri Lanka Ex-Air Force Association.